All this last minute party planning is so exhausting. I survived Diwali. I’m not taking any chances with Christmas. Along with sorting my festive glam outfit (red tights are so in) I’ve been in deep thought about Christmas nibbles. Festive snacks, it seems, are the mainstay of keen chefs and gluttons for punishment only. I am neither. You so won’t catch me wrapping 50 tiger prawns with 50 slices of prosciutto or fashioning 50 little kebabs to shallow fry in batches. I will be sitting in front of the roaring fire instead. Hurling abuse at my siblings. Glass of winter Pimms in one hand. Whopping everyone at Pictionary with the other. As if by luck, Santa came early this year. And he brought just the thing I needed for inspiration, a wonderful cookbook titled Modern Indian Cooking. Written by Vikas Khanna and Hari Nayak, two US-based Indian chefs, this cookbook does exactly what it says on the tin. There’s no “let’s put Indian ingredients together and pretend it’s what we grew up on” malarky. This is an unashamed tribute to the recipes your mother didn’t cook at home. Like almond crusted roast leg of lamb and peppers stuffed with coriander coconut cream. 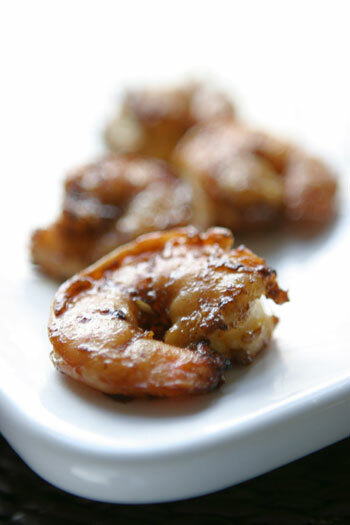 I made the superb prawns with tamarind glaze, which will definitely feature at Christmas. Two hours of marinating, three minutes of shallow frying give you one large plateful of lick-your-plate-clean prawns. Wash and dry the prawns. Mix with all the ingredients (bar the lemon juice) and two tablespoons of oil. Leave to marinate for about two hours. When ready to eat, shallow fry the prawns in the remaining oil on ether side for two to three minutes turning once during cooking. Pile up high on a large white platter and squeeze the lemon juice all over. PS = This is my entry for Zlamushka’s Spoonful of Christmas event on the grounds that the marinade (and cookbook) will make an excellent present. This sounds like a wonderful recipe. I love tamarind, and I even have all the ingredients right now (what are the chances?) Saving to del.icio.us! East meets west kinda cookbook! I will check it out. 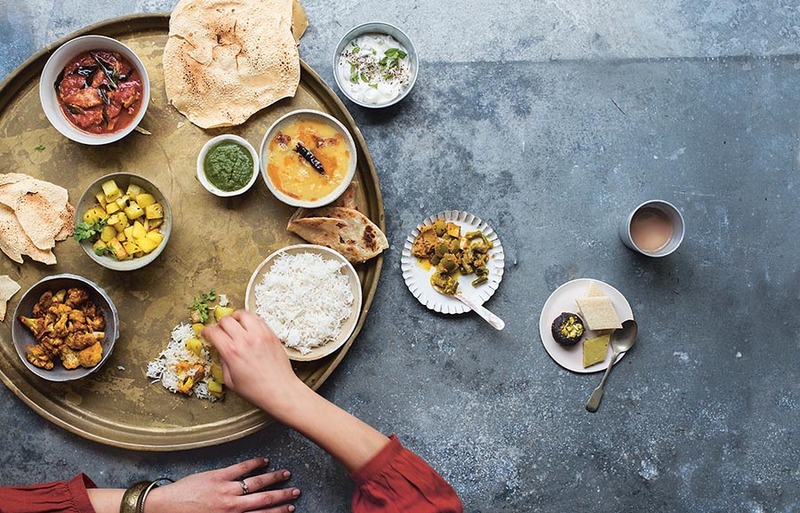 I love authentic Indian cookbooks which records “grandmothers” cooking. Mallika, I was waiting for this recipe and oh yes i am totally bowled over with your picture. I would love to try this and see as i never mixed tamarind and prawns!! Ho! I think it is shrimposhere in all NV blogs. Lovely pic and unique recipe. I have one mine too. Those look/sound amazing. Now to pick up some lovely, luscious shrimp and whip up a batch, be inspired to write a blog post and link to your page so that my friends can look at your photo and not mine. That sounds really a wonderful idea to chillout for christmas. I for sure know will be slaving in the kitchen as we will have most of the family comming to our place and i do the whole dinner. That looks absolutely delicous. I love anything with prawns in it. I will keep this recipe for when I am cooking prawns on the bbq. I usually just marinade them in honey, ginger, garlic and white wine but this recipe will make a nice change. Superb. It’s difficult enough to find savoury rather than sweet recipes for the festive season, and this is an all-year-round one. Until now I’ve just slit them down the back and fried them whole (heads and all) in garlic butter. Get them crisp, and the only thing you leave is a nearly-empty head for the cat and/or dog. I love prawns and these looks absolutely delicous. I must have a look at the “Modern Indian Cooking” book you suggest. This recipe is fantastic tried it many times and walla every time it turns out to be just perrrfect…thank you.